Photographer Justin Ng photographed Nova Delphinus 2013 on August 18, 2013. He is based in Singapore. Stargazers are thrilled over the surprise appearance of a star explosion, known as a nova, in the night sky last week, but there is more to this cosmic event than meets the eye. The new Nova Delphinus 2013 was first spotted in the constellation Delphinus (The Dolphin) by Japanese amateur astronomer Koichi Itagaki on Aug. 14 and quickly confirmed by other skywatchers soon after. Novas are stars that are undergoing a powerful eruption, causing them to brighten significantly, so that they appear suddenly in the night sky where previously no star was visible. Just how frequently does a nova become bright enough to be seen without the use of binoculars or a telescope? On average, new novas are detected about once every four or five years. Over the last 112 years, there have been 47 novas that have flared into naked-eye view. The majority of these — 26 — were quite dim and could only be positively identified by using a star chart or sky atlas. Novas that become as bright as Nova Delphini are more readily visible. Since 1901 there have been 13 novas in this category, which occur about once every 10 years. Even brighter objects, which shine about as much as Polaris the North Star and the other brightest stars in the sky, have been few. In fact, only six have appeared since 1901, meaning one occurs about every 20 years. However, we have not had one of these bright nova since 1975, so it seems we are overdue for another. Then there are those novas that are super-bright, attaining a magnitude of zero or even brighter. In 112 years, we have had only two that have become as brilliant as that; on average, we get one about every 60 years. However, we have not had a nova in this category since 1918, so certainly we are long overdue for a bright new star. The brightest nova in recent years was Nova Scorpii, also known as V1280 Scorpii. It attained a peak brightness of magnitude +3.9 on Feb. 4, 2007. The brightest nova in the last 70 years was Nova Cygni, also known as V1500 Cygni. This star attained a peak brightness of magnitude +1.7 on Aug. 30, 1975. And since 1901, the brightest nova ever — landing in the super-bright category — was Nova Aquilae, also known as V603 Aquilae. 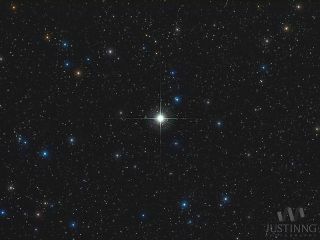 It attained a peak brightness of magnitude -1.4 on June 9, 1918, virtually matching Sirius, the brightest star in the sky!